This is half of a postcard showing Thomas Pratt, a.k.a. Little Tom Pratt, back row; and Thomas L. Pratt, a.k.a. 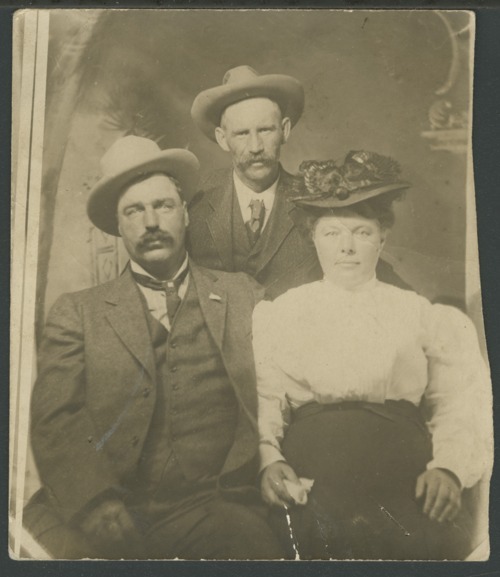 as Big Tom Pratt; and Elizabeth Mozier Pratt, Thomas L. Pratt's wife, front row. Thomas Pratt was the second son of Abraham Pratt, who owned the Cottonwood Ranch. Thomas L. Pratt was the son of George Pratt, an early Studley, Kansas, settler. Thomas Pratt and Thomas L. Pratt are not related.